First off, don't forget the blog contest. Just comment and you're entered to win chocolate! Now...I said when I started this shebang that I'd be writing about my faves and raves, among other things, so I had to share this exciting news: one of my all-time favorite books, Outlander, is being developed for the big screen. According to Sci Fi Week, which got it from Variety, some outfit called Essential Pictures already has a script, written by none other than Randall Wallace of Braveheart fame, and is looking for directors. I did a little digging and found out that EP is an expansion of a financing/distribution company and the two men set to head the new company have a modest list of producer credits. Their goal is 2-3 movies a year with budgets ranging from $10-$40 million. Not huge by Hollywood standards. Let's hope that Outlander doesn't get the Dune treatment. On the plus side, Oscar-winner Randall Wallace ain't a bad start. On the minus side, Wallace also won a Razzie for the worst screenplay of the year for Pearl Harbor. But there's another plus: one of the head honchos of Essential was executive producer on one of my favorite indies, Two-Family House, a great love story especially if you’re living in the south and miss those twisted Brooklyn accents. Okay, so there are the facts. Now onto the fun part. Casting. For years I’ve been thinking about Highlander TV star, Adrian Paul as the perfect Jamie. But TPTB sat around on their butts so long he might be too old. Then again, who cares? I think AP would make a great Jamie Fraser. He's big enough, has the leading man looks, can certainly use a sword, and he can handle the heavy as well as the lighter stuff. And given the budget I'll bet he'd be affordable. Then again, Hugh Jackman would also be amazing. 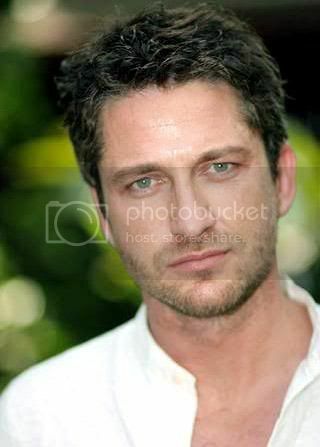 Gerard Butler already has the accent. 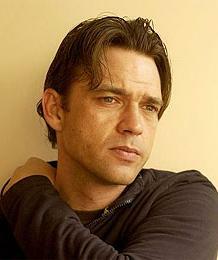 Dougray Scott has the accent and the right last name. Yeah, I know, not a red head among them...But that's what Nice n Easy is for. And Claire? You need intelligence and resourcefulness for her. Wouldn’t Cate Blanchett be fabulous? Of course all the above are over the age limit, but who's out there in their twenties who's good enough? You tell me. You're the casting director. Who would come to your auditions? Adrian Paul has the accent, too! Loved him all throughout The Highlander until he killed Richie. Since my son was a Dead Ringer for Richie, it bothered me even more. As for actors in their twenties, I'm afraid I have no clue who could play those parts. Pleading guilty to being out of it with younguns. So glad to find a fellow fan of Adrian Paul! Didn't know he was Scottish. English, yes, but not Scottish. Never thought he did a good one on the show, but that's okay. There's alwasy dialogue coaches... Hmm wonder who else is out there? I love Outlander. Will definitely be in line to see the movie. I love that you're blogging! And I need chocolate!